Cytokine induction of the MHC class I genes increases the nascent molecules available for binding potentially antigenic peptides. The human H chain loci, HLA-A, -B, and -C, encode highly homologous and polymorphic mRNAs. Here, these transcripts were resolved and measured by competitive PCR of cDNA using locus-specific primers. 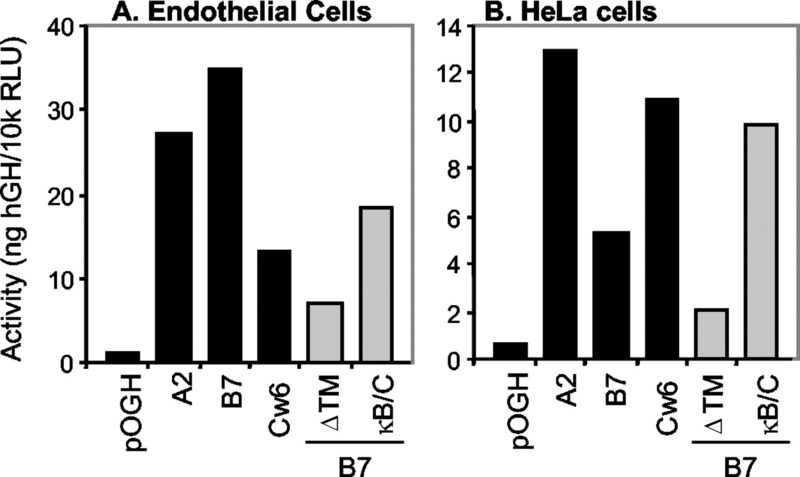 Endothelial cells expressed many HLA-A and -B, but fewer HLA-C, transcripts. In contrast, HeLa cells expressed many HLA-A and -C, but fewer HLA-B, transcripts. The inflammatory cytokines TNF-α, IFN-β, and IFN-γ induced HLA-B strongly, but HLA-A and -C weakly in both cell types. Combined treatment with IFNs and TNF further increased HLA-A and -B, but not HLA-C transcripts. The constitutive and inducible activities of transfected promoters correlated well with mRNA levels. The weak IFN response of the HLA-A2 promoter was not due to variations in the IFN consensus sequence, the site α, or a 3-bp insertion between them. The HLA-Cw6 promoter was less TNF responsive due to a variant κB enhancer, which also reduced the IFN responses. The NF-κB subunit RelA strongly activated the HLA-A2 and -B7 promoters but only weakly activated the HLA-Cw6 promoter due to the variant κB. Cotransfecting NF-κB1 with RelA further increased activity of the HLA-A2 and -B7, but not HLA-Cw6, promoters. All three promoters were activated by MHC class II trans-activator, but not CREB-binding protein, whereas IFN regulatory factor-1 and -2 weakly activated the HLA-B7 and -Cw6, but not HLA-A2, promoters. These studies illustrate common and locus-specific mechanisms that may be targeted to modulate immune reactions. The immune system detects infected cells, tumor cells, and transplanted allogeneic cells through changes in MHC class I molecules, which are expressed on the surface of nearly all mammalian cells. NK cells are inhibited when they recognize particular MHC class I molecules. Specific T lymphocytes are activated when they recognize antigenic peptides bound within the MHC class I molecules. A mature MHC class I molecule comprises a transmembrane H chain, an L chain (β2-microglobulin), and a single peptide that can derive from a very large number of different proteins. Peptides bind most readily to nascent MHC class I molecules as they fold and mature. MHC class I molecule synthesis is induced by the inflammatory cytokines TNF, IFN-γ, and IFN-β. These cytokines coordinately induce the transcription of H and L chain genes as well as the proteasome subunits, peptide transporters, and chaperones that support the maturation of MHC class I molecules (1). The expression of cell surface HLA class I molecules can be increased severalfold by increasing the expression of the H chain gene alone (2). The three human MHC class I H chain loci, HLA-A, -B, and -C, are homologous and highly polymorphic. The three loci can be expressed at different levels in different cell types (3, 4). The expression of a particular locus can be extinguished in tumor cells, which might contribute to immune evasion (3, 5). In contrast, some tumor cell lines express relatively high levels of HLA-C mRNAs (4), which might be protective against NK cells (6). The expression of the endogenous HLA class I loci has been studied by Northern blotting, nuclease protection, and RT-PCR. Northern blotting requires carefully established hybridization conditions to resolve the highly homologous HLA class I transcripts (3, 7). Moreover, the specificity cannot be easily tested. Similar considerations apply to nuclease protection assays. PCR-amplified HLA-A and -B cDNAs have been resolved by denaturing gradient gel electrophoresis (8). However, different PCRs must be performed for each template, and denaturing gels may not resolve all alleles. Recently, HLA class I gene transcripts were measured by locus-specific PCR of cDNA using oligonucleotide primers that end at fully conserved, locus-specific nucleotides (4). This is a specific application of the amplification refractory mutation system, which is based on the inability of DNA polymerase to efficiently extend an oligonucleotide primer mismatched at its 3′ end (9). This approach to measuring HLA class I transcripts can be applied to any human cell and allows the amplified target to be identified unambiguously by restriction digestion or sequencing (10). 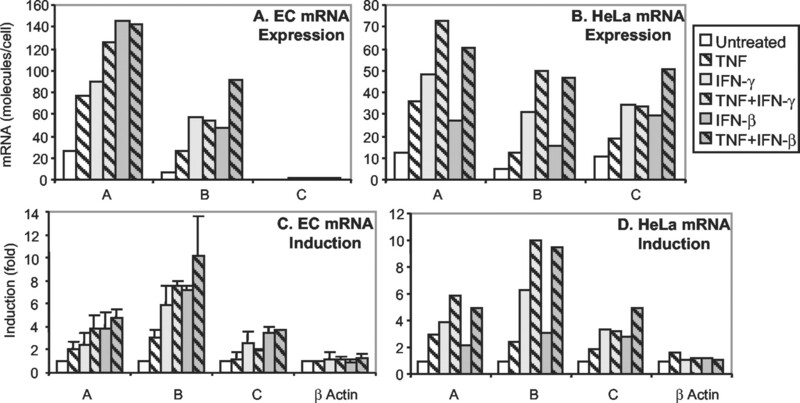 Here, the constitutive and cytokine-induced expression of the HLA-A, -B, and -C genes were compared in cultured human vascular endothelial cells (EC)3 and HeLa cells. Human and murine EC express relatively high levels of MHC class I molecules in vivo (11). In mice this elevated expression is supported by constitutive IFN-γ signaling (12). The functional significance of elevated expression by EC is unknown. To understand the mechanisms of differential constitutive expression and cytokine induction, the HLA class I promoter elements were compared using reporter genes. The promoters were analyzed by mutation and by cotransfecting expression vectors encoding transcription factors. These studies show that HLA class I loci have different constitutive and cytokine-induced expression patterns, some of which can be attributed to differences in the HLA class I promoters. Human EC were isolated from umbilical veins and cultured on gelatin-coated tissue culture plastic (Falcon) in medium 199 containing 20% FBS (Life Technologies, Grand Island, NY), 50 μg/ml endothelial cell growth factor (Collaborative Biomedical Products, Bedford, MA), 100 μg/ml porcine heparin (Sigma-Aldrich, St. Louis, MO), 100 U/ml penicillin, and 100 μg/ml streptomycin (Life Technologies). EC were used at passages 2–4. HeLa cells were cultured in DMEM containing 10% FBS, 1 mM glutamine, 100 U/ml penicillin, and 100 μg/ml streptomycin (all from Life Technologies). The cell lines 2fTGH, U2, U3, and U6 were gifts from Dr. G. Stark (Lerner Research Institute, Cleveland, OH). U3A and U3A+STAT1 were gifts from Dr. X.-Y. Fu (Yale Medical School, New Haven, CT). IFN-β (expressed in Escherichia coli; 3 × 108 U/mg) was provided by Biogen (Cambridge, MA). IFN-γ (expressed in E. coli; 107 U/mg) and TNF-α (expressed in E. coli) were purchased from R&D Systems (Minneapolis, MN). IFN-β was used at 1000 U/ml, IFN-γ at 100 ng/ml, and TNF at 5 ng/ml. Surface expression of HLA class I molecules was measured as described previously (1). Briefly, cells (5 × 104) were treated with saturating amounts of a pan-class I Ab, W6/32 (American Type Culture Collection, Manassas, VA), or an Ab specific for many HLA-B alleles, 4D12 (American Type Culture Collection), and stained with a fluorescent secondary Ab. The mean fluorescence intensity of 5 × 103 viable cells was measured with a flow cytometer (FACScan; BD Biosciences, San Jose, CA). RNA was analyzed by competitive PCR as described previously in detail (4). Briefly, total RNA (2 μg) was reverse transcribed with oligo(dT), treated with RNase H, and made up to 50 μl. cDNAs were diluted 1/2 for HLA competitions or 1/20 for β-actin competitions. Competitor templates were initially diluted 1/106 for HLA or 1/105 for β-actin, followed by four serial dilutions of 1/3. The equivalence point was determined from the line fit to the ratio of competitor and cDNA products from four gel lanes (typical r2 > 0.96). A 471-bp fragment of MHC class II trans-activator (CIITA) cDNA was amplified with the primers CIITA.51 (CAAGTCCCTGAAGGATGTGGA) and CIITA.31 (ACGTCCATCACCCGGAGGGAC) (13). A 1215-bp portion of IFN regulatory factor (IRF)-1 cDNA was amplified with the primers human IRF1.51 (GCTCTAGACTCCTGCAGCAGAGCCAAC) and human IRF1.31 (CGGAATTCGGGCCAGCTTTACACCACA). As noted in some experiments, cDNAs were measured by real-time PCR on an iCycler (Bio-Rad, Richmond, CA) with AmpliTaq Gold and SYBR Green I (PE Applied Biosystems, Foster City, CA). Gel analysis of the real-time PCR products revealed single bands of the correct size with minimal background (not shown). However, these PCR products produced broad melt curves, perhaps due to their large size (∼1 kb). Therefore, except where noted, the results of competitive PCR were reported. A 426-bp portion of the HLA-A2 promoter was amplified from genomic DNA prepared from JY lymphoblastoid cells by PCR using primers HLAA.51 (AGGGACAGAGATTACGGGAT) and HLABC.31 (CTCGGCGTCTGAGGAGA). Restriction endonuclease sites were added with primers HLAA.54 (GGCAAGCTTAGATTACGGGA) and HLAB.34 (CGGGATCCCTCGGCGTCTG), and the promoter was cloned between the HindIII and BamHI sites of the human growth hormone (hGH) reporter gene pOGH (Nichols Institute Diagnostics, San Juan Capistrano, CA). The sequence of this clone is identical with the HLA-A2 promoter sequence in GenBank (accession K02883) from position −246 through the transcription initiation site (see Fig. 3⇓B). A 426-bp portion of the HLA-B7 promoter (described previously (14)) was subcloned by PCR using primers HLAB.51 (AGGGACAGGGATTCCAGGAC) and HLAABC.31, then HLAB.54 (GGCAAGCTTAGGGATTCCAGGA) and HLAB.34. A 426-bp portion of the HLA-Cw6 promoter was cloned from HeLa cells using primers HLAC.51 (AGGGACGGGGATTCCAGGAG) and HLAABC.31, then HLAB.54 and HLAB.34. The sequence of this clone is identical with the HLA-Cw6 promoter sequence in GenBank (accession Z22752) from position −242 through the transcription initiation site. The mutant HLA-A2 or -B7 promoters were generated by recombinant PCR using the flanking primers HLAB.34 and HLAA.54 or HLAB.54, respectively, with the mutant internal primers listed beneath the consensus sequence (Fig. 3⇓B). A large deletion was made in the HLA-B7 promoter, generating ΔTM-B7, by cutting with Tth111 I (−295) and MluI (−110), then filling and ligating the ends. All constructs were confirmed by sequencing (Keck Biotechnology, Yale Medical School). The normal HLA-B7 and mutant ΔTM promoters were also subcloned from SacI to BamHI fragments of the hGH reporter constructs into the SacI and BglII sites 5′ of a firefly luciferase reporter gene (pGL3.BAS; Promega, Madison, WI). Luciferase assays of cell lysates were performed using a kit according to the manufacturer’s instructions (Promega). EC were transfected by DEAE-dextran, HeLa cells were transfected with cationic liposomes, and STAT mutant cells were transfected by CaPO4 precipitation as previously described (2, 15). For the cytokine treatments, one large transfection mixture was divided among six wells. EC (105) were cultured overnight in C12 wells. DNA (1.5 μg in 125 μl PBS) and DEAE-dextran (125 μl, 0.5 mg/ml PBS) were mixed and added to PBS-rinsed cells for 30 min. Complete medium (1 ml) with 80 μM chloroquin was then added for 3 h. This was aspirated, and the cells were treated with 0.25 ml 10% DMSO in complete medium for 2.5 min. This was aspirated, and the cells were cultured in complete medium overnight. HeLa cells (105) were cultured overnight in C24 wells. DNA (1 μg) and Lipofectamine (3.5 μl; Life Technologies), each in 80 μl serum-free medium (OptiMEM; Life Technologies), were mixed together and incubated for 20 min at room temperature. The DNA-Lipofectamine mix was added along with 0.15 ml OptiMEM to PBS-rinsed HeLa cells, which were cultured for 3 h. The mixture was then replaced with complete growth medium. The next day, EC and HeLa cells were treated with cytokines in fresh medium. Transfection efficiency was monitored by adding a β-galactosidase vector (CMV-βGal; Clontech, Palo Alto, CA) and a firefly luciferase gene (GL3.Basic; Promega) under the control of an Sp1 enhancer-thymidine kinase minimal promoter (Sp1TK.GL3). Expression vectors encoding NF-κB1, RelA and c-Rel, and the empty vector (RcCMV), were gifts from S. Ghosh (Yale Medical School). IRF-1 and IRF-2 expression vectors (Act1 and Act2) were described previously (16). The CIITA expression vector was a gift from R. Flavell (Yale Medical School). The CREB-binding protein (CBP) expression vector was a gift from R. Evans (The Salk Institute, La Jolla, CA). The expression of HLA class I molecules on the surface of cultured EC and HeLa cells was measured by FACS. Cultured EC and HeLa cells expressed equivalent levels of HLA class I molecules (Fig. 1⇓, A–C). The cytokines TNF, IFN-γ, and IFN-β, alone or in combination, increased the surface expression up to 10-fold in 24 h on both cell types. Combined treatment with TNF and IFN-γ or IFN-β produced further increases in expression. Staining with an mAb (4D12) that recognizes HLA-B molecules on HeLa cells demonstrated that HLA-B expression is more inducible than is total HLA class I (Fig. 1⇓D). These findings are consistent with the report that IFN-treated Molt 4 cells increased their surface expression of HLA-B molecules more strongly than average (W6/32 reactive) HLA class I molecules (17). However, Ab binding cannot be used to compare absolute levels of protein expression, because different Abs distinguish the loci. In addition, allelic HLA class I proteins show widely varying stability and rates of maturation, which may be due to intrinsic structural differences or different availability of binding peptides. HLA class I molecules are expressed equivalently on EC and HeLa cells. EC and HeLa cells were treated with cytokines for 24 h, and cell surface expression was measured by fluorescence flow cytometry (FACS). Representative histograms of EC (A) and HeLa cells (B) are shown. C, Expression is plotted as the mean fluorescence intensity (MFI) of 5000 cells (coefficient of variation, ∼60%). D, The cytokine induction of total HLA class I molecules, detected by the mAb W6/32, and that of HLA-B molecules, detected by 4D12, are plotted. The intensity of the HLA-B stain was ∼1/10th that of the total HLA class I stain. These results are representative of three independent experiments. Expression of the HLA class I loci was compared at the level of gene transcripts. Total mRNA was reverse transcribed with oligo(dT) into cDNA, which was measured by competitive PCR (RT-cPCR) using locus-specific primers and a competitor template with an internal deletion (4). Competitive PCR under these conditions is highly reproducible (coefficient of variation, ≤0.3 for HLA-A, -B, and -C and β-actin) (4). To detect and quantify cross-priming, e.g., HLA-A primers amplifying HLA-B cDNA, real-time PCR was performed. Specific and nonspecific amplification of HLA-A, -B, and -C cDNA clones and a control β-actin clone were compared (4). Of the 12 PCRs, three weak cross-primings were detected (Table I⇓). However, the correct priming was always much stronger than the cross-priming. Furthermore, the products of PCR-amplified cDNA identified by sequencing or restriction digestion were always correct (10). Therefore, these primers all demonstrated very high locus specificity. Transcripts encoded by all three HLA loci were detected by RT-cPCR in cDNA prepared from untreated EC and HeLa cells, demonstrating that both cell types express HLA class I mRNAs constitutively (Fig. 2⇓). There are more HLA-A transcripts than HLA-B transcripts in both cell types (Fig. 2⇓, A and B). However, dramatically different levels of HLA-C transcripts were detected in EC and HeLa cells. Whereas EC express HLA-C at very low levels, HeLa cells express HLA-C at levels nearly equal to those of HLA-A (Fig. 2⇓, A and B). These patterns of expression were observed in three independent preparations of HeLa cell mRNA, three independent preparations of EC pooled from several donors, and two preparations of EC from single donors (4). HLA class I locus transcripts are differentially induced in untreated and cytokine-treated cells. Cells were treated with cytokines for 18–20 h, then harvested and analyzed for HLA-A, -B, and -C mRNAs by RT-cPCR. The number of transcripts per cell (absolute expression) is plotted for EC (A) and HeLa cells (B). Induction is plotted in C (EC) and D (HeLa cells). For EC, the average and SD of three independent experiments with individual cytokines and two experiments with cytokine combinations are shown. The results of the single full assay of HeLa cell mRNA shown here are representative of more than three independent partial assays and several assays performed at different times after induction. TNF, IFN-γ, and IFN-β increased transcripts from all three HLA loci, but not β-actin (Fig. 2⇑, C and D). Induction of the HLA-B locus was strongest and that of the HLA-C locus was the weakest in both cell types. 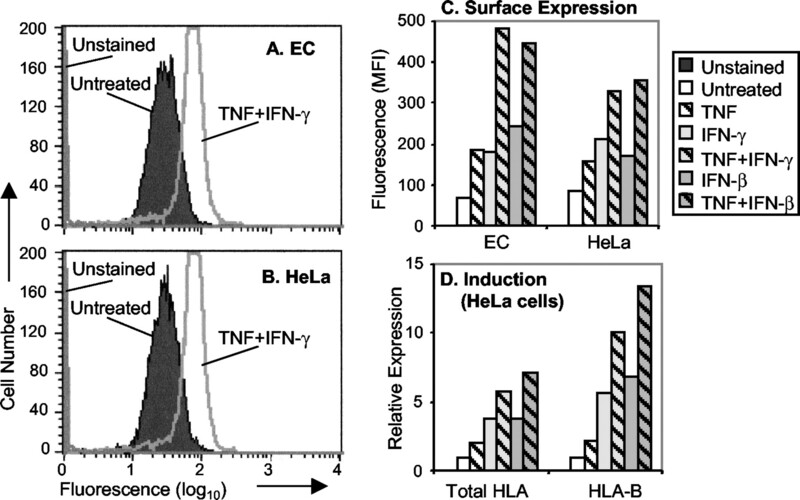 Induction was also comparable between EC and HeLa cells, ranging up to ∼10-fold over 18 h.
IFNs combined with TNF induced greater-than-additive (synergistic) increases in cell surface HLA class I surface expression (Fig. 1⇑), which has been attributed to a synergistic increase in gene transcription (14, 18). HLA-B transcripts were synergistically increased in HeLa cells treated with TNF and IFNs (Fig. 2⇑). HLA-A induction by TNF and IFNs was roughly additive. TNF further increased HLA-C transcripts induced by IFN-β, but not IFN-γ, a result that was confirmed by real-time PCR (Fig. 2⇑ and data not shown). In EC, however, cotreatment with IFN and TNF only modestly increased HLA-A and -B transcripts and decreased HLA-C transcripts. Therefore, HLA class I genes show locus-specific and cell type-dependent cytokine responses. Constitutive HLA class I promoter activities. To analyze the mechanisms of HLA class I expression, representative promoters from each locus (HLA-A2, -B7, and -Cw6) were cloned in front of a reporter gene (hGH). Two HLA-B7 promoter mutants were constructed, a large deletion (ΔTM) and the replacement of the κB enhancer with the HLA-C κB (κBB→C; Fig. 3⇓). These constructs and a control luciferase vector were transfected into EC and HeLa cells. HLA class I promoters exhibit locus specific variations. A, Diagram of a HLA class I promoter. B,The sequences of wild-type promoters are listed along with the consensus sequence and the primers used to generate the mutant κB, ICS, and site α promoters. Enhancers are shown in a gray background within the consensus sequence: the κB enhancer (−193 to −181), the ICS (−171 to −159), the W box (−151 to −145), the X box/site α (−127 to −110), and the enhancer B (−92 to −87). The 3′ primer used to generate the promoter mutants (HLAABC.31) and the variant TATA box (TCTA) are underlined. Numbering follows that of Kushida et al. (54 ); the putative start site is 20 nucleotides 5′ of the first codon. All three HLA class I promoters were constitutively active in both EC and HeLa cells (Fig. 4⇓). The relative activities of the promoters correlated with the constitutive levels of mRNA (Fig. 3⇑), except for the HLA-A2 promoter, which was weaker than the HLA-B7 promoter in EC. The minimal HLA-B7 promoter, ΔTM, was much less active than the full-length promoter, demonstrating a role for constitutive enhancers within the deleted fragment. HLA class I promoters are active constitutively in EC and HeLa cells. Reporter genes under the control of HLA class I promoters were transfected with a control reporter gene (Sp1-TK.luc) into EC (A) and HeLa cells (B). Culture supernatants and cells were harvested on day 2. Human GH was measured in the supernatant, and luciferase was measured in the cell lysates. Similar results were obtained in two experiments with EC and four independent experiments with HeLa cells. The activities of the HLA-B7 and -Cw6 promoters were divergent in EC and HeLa cells. One clear difference between these promoters is the κB enhancer (Fig. 3⇑). When HLA-B7 κB was replaced with HLA-C κB, the activity of the mutant promoter became more HLA-C-like, i.e., lower in EC and higher in HeLa cells (κB/C; Fig. 4⇑). Similar results were obtained in additional experiments with subsets of these reporter-promoter constructs and in experiments harvested at different times. This finding suggests that proteins binding to locus-specific κB enhancers control the constitutive promoter activity. The role of the κB enhancer was analyzed further by transfecting expression vectors encoding NF-κB subunits (see below). Cytokine-induced HLA class I promoters. Cells transfected with the HLA class I locus promoter-reporter genes were treated with cytokines. The HLA-A2 and -B7 promoters, but not the HLA-Cw6 promoter, responded to TNF strongly in EC and weakly in HeLa cells (Fig. 5⇓). The HLA-A2 promoter did not respond to either IFN in EC and responded only weakly to IFN-γ in HeLa cells. In contrast, the HLA-B7 promoter responded strongly to both IFN-γ and IFN-β in HeLa cells and to IFN-β, but not IFN-γ, in EC. The HLA-B7 promoter also appears to mediate synergy between IFN-β and TNF in both cell types. 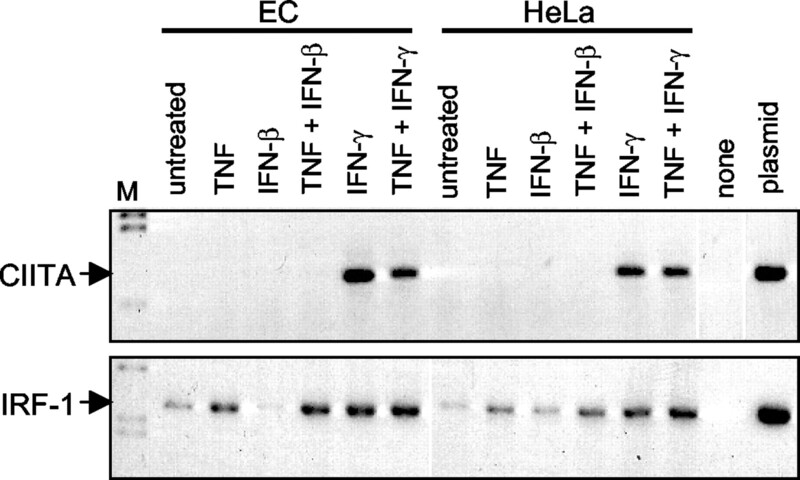 The HLA-Cw6 promoter responded only to IFN-β in both EC and HeLa cells. Therefore, these promoters demonstrated both locus-specific and cell type-dependent cytokine responses. Cytokine-induced HLA class I promoter activities are locus specific. EC (A) and HeLa cells (B) were transfected with HLA class I reporter genes. Cells were treated with cytokines for 20 h. The average induction (treated/untreated) and SD of three independent experiments with HeLa cells are plotted. Similar results were obtained in more than four independent experiments using subsets of this construct panel. To determine the enhancers mediating locus-specific responses, the cytokine-responsive HLA-B7 promoter was mutated. Two enhancers, the κB and the IFN consensus sequence (ICS), have been implicated in the responses to TNF and IFNs (19, 20, 21, 22). When the κB was changed to the HLA-C κB (κB/C), all cytokine responses were reduced (Fig. 6⇓). When the ICS was changed to the HLA-A ICS (ICS/A), the cytokine responses remained strong in HeLa cells. In EC, however, the ICS/A mutant was unresponsive to IFN-γ. A different ICS mutation abolished IFN responses and reduced TNF responses in both cell types (mICS; Fig. 6⇓ and Table II⇓). This ICS mutation was patterned on a mutation of the ISRE (IFN-stimulatable response element) in the 9–27 gene promoter that abolished responses to both IFN-α and IFN-γ (23). These results demonstrate the essential roles for both the κB and ICS enhancers in the cytokine responses of HLA class I promoters. Enhancers mediate cytokine responses. EC (A) and HeLa cells (B) were transfected with wild-type and mutant HLA-B promoter reporter constructs, then treated with cytokines. For EC, the promoter activities are normalized with the cotransfected luciferase control plasmid. For HeLa cells, the average induction and SD from three independent experiments are shown. Enhancer spacing can affect their ability to interact. For example, adding 5 bp between the X and Y boxes of HLA-B7 (Fig. 3⇑) disrupts their ability to mediate induction by coactivators (24). Relative to the HLA-B and -C promoters, HLA-A promoters contain a 3-bp insertion between the ICS and W enhancers (Fig. 3⇑). To test whether this insertion is responsible for the reduced cytokine response of HLA-A promoters, it was removed in a mutant HLA-A2 promoter. The cytokine responses of the deletion mutant and the normal HLA-A2 promoters were indistinguishable (not shown), suggesting that altered spacing between these enhancers was not responsible for the reduced cytokine response of HLA-A promoters. Cytokines increase gene expression by inducing or activating transcription factors that associate specifically with promoters. For example, IFN-γ induces the transcription factor IRF-1, which binds strongly to the HLA-B ICS, but weakly to the HLA-A ICS (14). A second IRF family member, IRF-2, also binds the ICS and can be a transcription repressor (25). The transcription factor CIITA is essential for HLA class II expression and also contributes to HLA class I expression (26, 27). The expression of CIITA and IRF-1 in EC and HeLa cells was analyzed by RT-PCR. 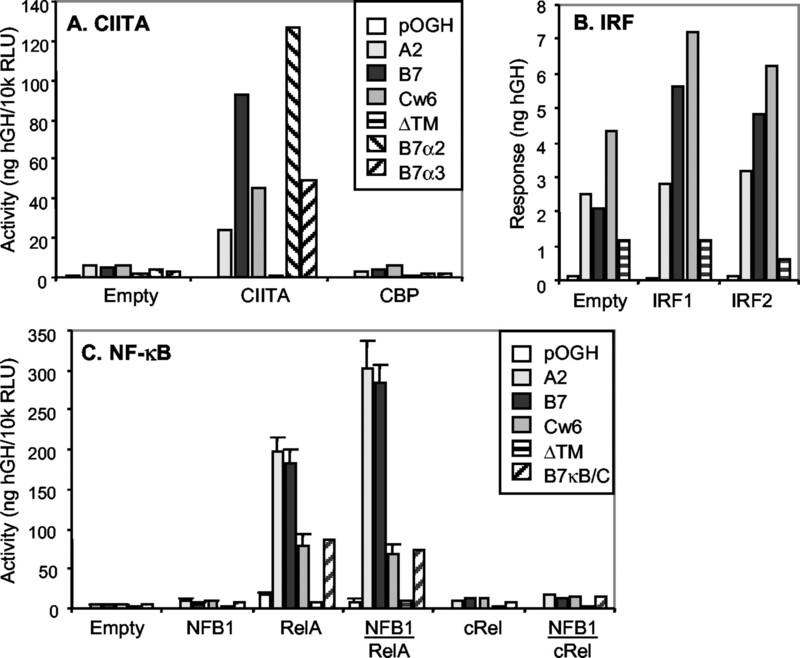 EC and HeLa cells both constitutively express IRF-1, but not CIITA, mRNAs (Fig. 7⇓). Only IFN-γ induces CIITA mRNA. IRF-1 mRNA is increased by TNF and IFN-γ, but not IFN-β. Therefore, EC and HeLa cells exhibit identical patterns of CIITA and IRF-1 mRNA induction by cytokines. IRF-1 and CIITA are expressed by EC and HeLa cells. IRF-1 and CIITA mRNAs were detected by RT-PCR and gel electrophoresis. The ethidium-stained gel is shown inverted for clarity. The sources of the templates used in the reactions are listed above the lanes. Size markers were BstEII-cut λ DNA (M; New England Biolabs, Beverly, MA). To test the ability of IRFs and CIITA to activate HLA class I promoters, expression vectors were transfected together with wild-type or mutant promoter-reporter constructs. CIITA strongly activated all three HLA locus promoters, with HLA-B7 the most strongly activated (∼20-fold; Fig. 8⇓A). This is consistent with the observation that lymphoblastoid cell lines, which express CIITA constitutively, express high levels of HLA-B mRNAs (4). Many transcription factors, including IFN-activated STATs, depend on the general transcription coactivator CBP to induce certain genes (28). However, CBP expression did not activate the HLA class I promoters (Fig. 8⇓A). Transcription factors activate HLA class I promoters. HeLa cells were transfected with nuclear factor expression constructs (0.1 μg each), HLA promoter reporter genes (0.4 μg), and Sp1TK. GL3 (0.2 μg). DNA was made up to 1 μg with the empty expression vector (RcCMV). A, CIITA drives the expression of HLA-A, -B, and -C promoters. Luciferase activity was induced ∼50-fold by both IRF-1 and -2, but not by CIITA, coexpression (not shown). B, IRF1 and IRF2 drive the expression of HLA-B and -C, but not -A, promoters. These HLA promoter activities were not corrected by the control luciferase responses. Similar results were obtained in two experiments with IRF-1 and -2 and more than three experiments with CIITA and CBP. C, Expression vectors encoding containing RelA superactivate the HLA-A and -B, but not -C, promoters. Sp1-driven luciferase activity was not altered by NF-κB coexpression. The average and SD from one experiment are plotted. Similar results were obtained in two independent experiments. IRF-1 and IRF-2 weakly activated the HLA-B7 and -Cw6 promoters (∼2-fold), but not the HLA-A2 promoter (Fig. 8⇑B). Since IFN-γ induction of CIITA requires IRF-1 (29) and is enhanced by IRF-2 (30), IRFs may indirectly activate HLA class I promoters by inducing CIITA expression. However, the results are also consistent with direct activation, because IRF-1 binds more strongly to the HLA-B ICS than the HLA-A ICS (14, 31). Surprisingly, both IRFs activated the control Sp1.TK.GL3 luciferase reporter gene (∼50-fold), demonstrating their capacity to strongly activate certain promoters. CIITA recognizes MHC promoters through interactions with the proteins regulatory factor X (RFX), CREB, and nuclear factor Y, which bind to the X1, X2 (site α), and Y enhancers, respectively, in MHC class II promoters (32). Homologous regions in the MHC class I promoters were noted by van den Elsen and colleagues (33). The HLA-A3 promoter contains a single base change in the site α core sequence that would be expected to abolish CREB binding (27) (Fig. 3⇑ and Table II⇑). To test the function of variant site α sequences, the HLA-B7 site α was mutated to match the site α enhancers in HLA-A2 or -A3 (see Fig. 3⇑). Both mutants mediated CIITA trans-activation (B7α2, B7α3; Fig. 8⇑A) and strong responses to TNF and IFNs (not shown), suggesting that the site α differences do not alone account for the lower response of the HLA-A promoters. The same conclusion was recently reported by Gobin and van den Elsen (34). TNF activates the transcription factor NF-κB, which binds HLA-A and -B κB, but not HLA-C κB (14). These complexes contain RelA (p65), NF-κB1 (p50 precursor), and c-Rel subunits (35). The subunit composition of NF-κB determines its activity. For example, promoters of the ICAM-1 and VCAM-1 genes are activated by RelA, but not NF-κB1, and coexpression of RelA and NF-κB1 decreases ICAM-1 promoter activity (36, 37). To test the ability of NF-κB isoforms to activate HLA class I promoters, expression vectors encoding NF-κB subunits were transfected with wild-type and mutant promoters. RelA activated all three HLA class I promoters (Fig. 8⇑C). The HLA-A2 and -B7 promoters were induced approximately twice as strongly as the HLA-Cw6 promoter or the mutant HLA-B7 promoter containing the HLA-C κB (B7κB/C). Moreover, cotransfection with NF-κB1 further increased the activities of the HLA-A2 and -B7 promoters, but not the other promoters. Therefore, the weaker TNF response of the HLA-C gene (Figs. 2⇑ and 5⇑) can be directly attributed to a reduced binding of NF-κB containing RelA and NF-κB1 to the variant κB enhancer. CIITA and RelA synergistically activate a transfected HLA-B7 promoter in Molt4 cells (38). In addition, NF-κB (RelA/NF-κB1) and IRF-1 cooperate in activating the IFN-β gene enhancer in vitro and the VCAM-1 promoter in transfected cells (39, 40). To detect additional interactions between these proteins, combinations of the expression vectors encoding CIITA, CBP, IRF-1 and -2, RelA, NF-κB1, and c-Rel were cotransfected with the HLA-B7 promoter reporter. However, no combination of individually inactive proteins activated the HLA-B7 promoter, nor did any modulate the activity of CIITA or RelA/NF-κB1 (not shown). The ICS is essential for the cytokine inducibility of the HLA class I promoter (Fig. 6⇑), but the identities of the binding proteins are uncertain. 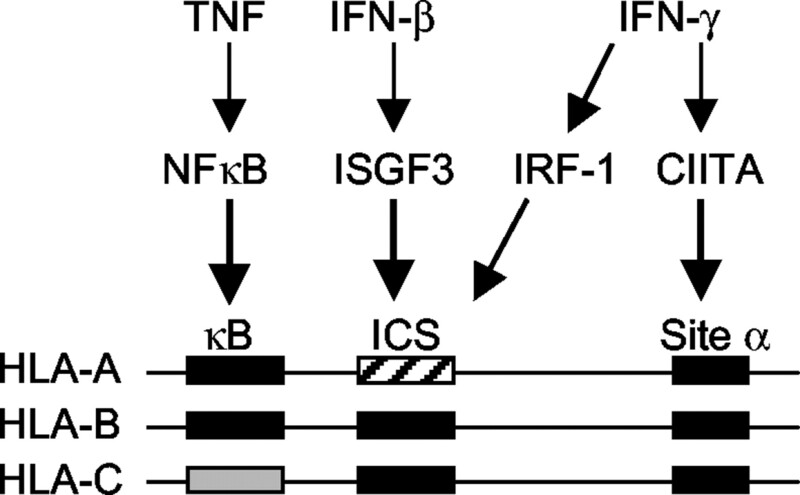 Although IFN-stimulated gene factor 3 (ISGF3) mediates many IFN responses, it has not been shown to bind the ICS. IFN-γ-induced IRF-1 binds the ICS in vitro (14, 31). However, the IFN-β response of MHC class I genes is intact in IRF-1 knockout mice (41). In addition, IFN-β treatment of EC and HeLa cells does not induce IRF-1 proteins that bind the HLA class I ICS (14) (data not shown). Waring et al. (42) characterized a constitutive activator protein that binds to the ICS of HLA-A2, but not HLA-B7. Vellejo and Pease (43) identified an IFN-γ-induced protein that binds to the HLA-B ICS, but only weakly to the HLA-A ICS. Its m.w. and its presence in mutant cells suggested that it is neither IRF-1 nor ISGF3. To help identify the proteins mediating HLA class I promoter activation by IFN-β, the HLA-B7 promoter-reporter construct was transfected into ISGF3 mutant cells: the ISGF3γ mutant U2, the STAT1 mutant U3, and the STAT2 mutant U6 (44). The HLA-B7 promoter responded to IFN-β in the parent cell line (2fTGH), but not in any of the mutant cell lines (data not shown). 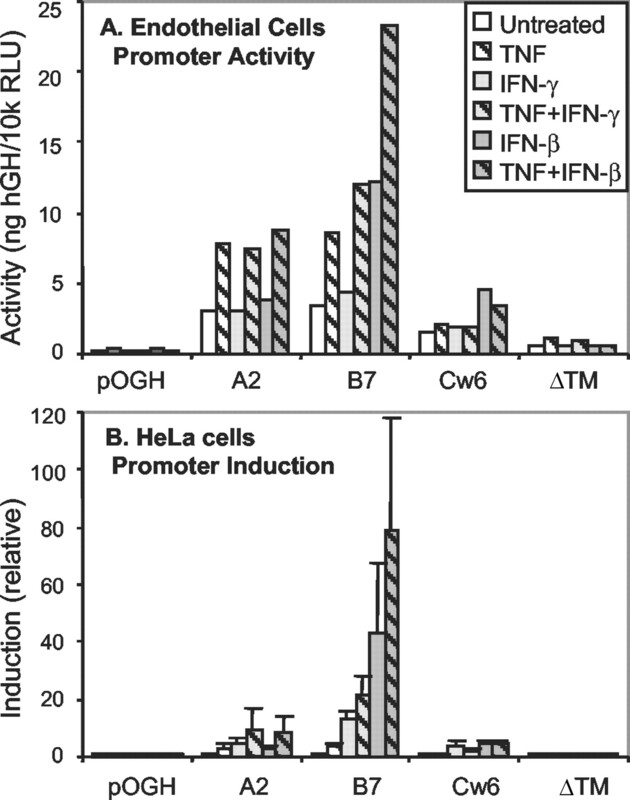 Thus, all three components of ISGF3 contribute to the IFN-β response of the HLA-B7 promoter. The first step in studying the mechanisms of gene expression is to accurately measure the transcripts of the endogenous genes. The extremely high polymorphism and homology of the HLA class I genes makes their transcripts relatively difficult to resolve and measure. Consequently, many studies of HLA gene expression have grouped the genes together, averaging the expression pattern, which could obscure differences in expression mechanisms. Alternatively, the activities of the cloned promoters have been studied as surrogates. However, the loss of promoter context within the gene and the failure to account for mRNA processing limit this approach. Here, the endogenous HLA-A, -B, and -C transcripts were measured by RT-cPCR with locus-specific primers. These primers end at locus-specific nucleotides that are conserved even in non-human primates, strongly suggesting that they could amplify all alleles of the corresponding human loci (10). In HeLa cells and cultured human umbilical cord EC, the HLA-A genes are expressed at higher levels than the HLA-B genes (Fig. 2⇑). The most dramatic difference in constitutive expression was observed for the HLA-C locus, which is expressed at very low levels in EC, but at relatively high levels in HeLa cells (Fig. 2⇑). Promoter activity correlated well with the HLA-B and -C transcript levels. Replacing the HLA-B κB with the HLA-C κB reversed the promoter activities (Fig. 4⇑), suggesting that the variant κB enhancer is constitutively active in HeLa cells. Cytokines induce up to a 10-fold increase in HLA-B mRNAs and up to 5-fold increase in HLA-A and -C mRNAs over a 20-h period in EC and HeLa cells (Fig. 2⇑). The expression of HLA class I molecules on the cell surface does not correlate precisely with mRNA. For example, synergy between TNF and IFNs is more marked at the level of surface expression than mRNA (compare Figs. 1⇑ and 2⇑). These differences could arise from the relative stability of the proteins in comparison with mRNAs. In addition, cytokines may act preferentially on different steps in HLA class I protein expression, producing a higher level of synergy at the protein level than is observed for any individual component. For example, whereas IFN-γ, but not TNF, strongly activates the TAP1 promoter, TNF, but not IFN-γ, strongly activates the HLA class I promoters in EC (1) (Fig. 5⇑). The differential IFN responses of the HLA-B7 and HLA-A3 promoters were ascribed by Hakem and colleagues (45) to a 2-bp difference in the ICS. However, the HLA-A3 ICS could mediate full IFN responses in HeLa cells when it replaced the ICS within the HLA-B7 promoter (Fig. 6⇑) (14). 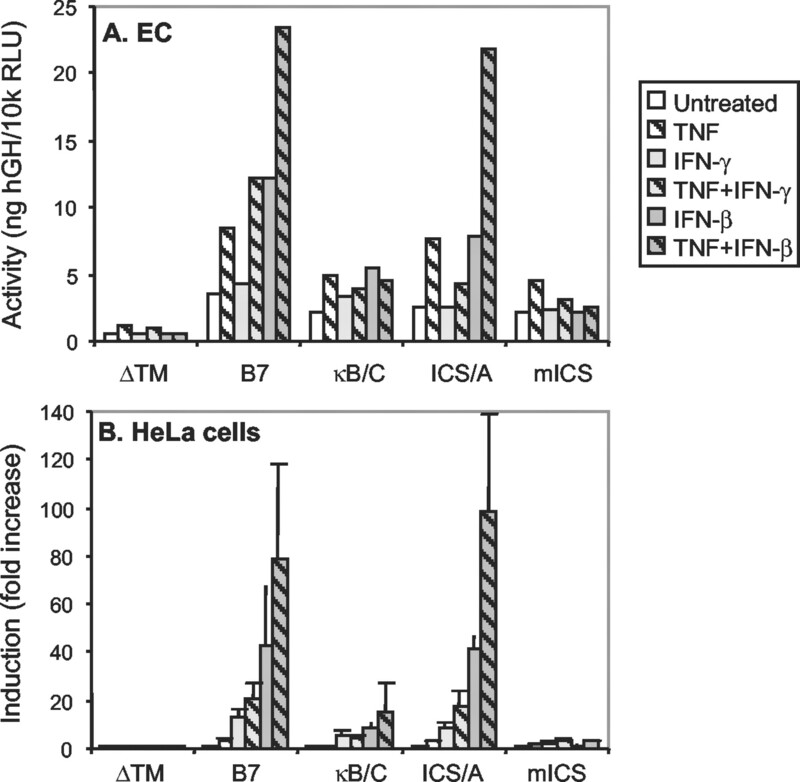 In EC, the HLA-A ICS mediated IFN-β, but not IFN-γ, responses, suggesting a cell type-specific activity (Fig. 6⇑). The 2-bp κB variant found in the HLA-C promoter reduced TNF responses and abolished synergy with IFNs (Fig. 6⇑). Thus, variations in the κB enhancer, but not the ICS, underlie the locus-specific cytokine responses. Variations in both enhancers underlie cell type-specific promoter activities. Mutations in either the ICS or the κB site can dramatically reduce responses to IFNs and TNF (Fig. 6⇑). The interdependence of these enhancers was first appreciated by Israël and colleagues (46). The molecular basis is unclear, because individual cytokines activate proteins binding to only one enhancer (14). It is possible that additional cytokine-activated proteins that bind to the other enhancer are not detected in vitro. Alternatively, constitutive proteins binding to one enhancer could contribute to the activity of cytokine-induced proteins binding to the other enhancer. For example, NF-κB1 homodimers are present in the nuclei of resting HeLa cells and EC (35), and a constitutive ICS-binding protein has been characterized (42). A single nucleotide mutation of the HLA-B7 ICS abolished responses to IFNs and reduced responses to TNF (mICS; Fig. 6⇑ and Table II⇑). This mutation probably abolishes binding of all IRF family proteins, including IRF-1 and the DNA-binding subunit of ISGF3, ISGF3γ (p48) (23). All three components of ISGF3 are required for the IFN-β response of the HLA-B7 promoter (data not shown). In a different STAT1 mutant, the unresponsiveness of the endogenous HLA class I genes to IFN-γ was ascribed to a failure to induce CIITA expression (26). However, IFN-β did not induce CIITA expression (Fig. 7⇑). Moreover, IFN-β induction of MHC class I genes was intact in cells from IRF-1 knockout mice (41), strongly suggesting that IRF-1 does not mediate IFN-β induction of the MHC class I genes. Taken together, the simplest explanation of these findings is that ISGF3 mediates the IFN-β response of the HLA class I promoter (Fig. 9⇓). Variant, cytokine-inducible enhancers regulate the HLA class I promoters. The κB enhancers of the HLA-A and -B, but not -C, promoters mediate TNF-induced transcription by NF-κB (RelA/NF-κB1). The HLA-C κB contributes to constitutive transcription in HeLa cells. The ICS enhancers of all HLA class I loci mediate IFN-β responses in both cell types and IFN-γ responses in HeLa cells, but not EC. Transcripitional activation by IFN-β requires all ISGF3 subunits. Cytokines activate transcription of HLA-B promoter most strongly, then HLA-A and -C, due to combinations of variant enhancers. Of the enhancers identified in the HLA class I promoters, only the Y box (−97 to −92) shows no interlocus variation (Fig. 3⇑). This constitutive enhancer, also known as enhancer B (20), is dispensable for cytokine induction (14) and CIITA coactivation (24). The X enhancer binds RFX, CREB1, activating transcription factor 1, and upstream stimulatory factor-1 (USF1) in vitro (24, 38). X is divided into 5′ X1 and 3′ X2, which is also known as site α. Strong functional evidence suggests that the RFX complex binds to the X1 box in HLA class I genes and mediates CIITA coactivation (32, 47). The nature of the complex is unclear, however, because the RFX subunits, RFX-B, RFX5, and RFXAP, do not contain known DNA binding domains. Only a USF binding site is recognized in the HLA-B X/site α by the search program MatInspector using the TRANSFAC 4.0 database of transcription factor binding sites (Table II⇑B) (48). Many HLA class I X1 sequences contain the consensus USF site, although HLA-A1 and -Cw6 do not (Table II⇑B). Nevertheless, the HLA-Cw6 promoter mediated CIITA responses (Fig. 8⇑A), suggesting that this locus-specific X1 variation is not functional. Differential expression of the HLA class II genes has been attributed to divergent X2 sequences (49, 50), supporting the possibility that variations in the HLA class I promoter X box could underlie differential expression. The site α/X2 enhancer displays only small differences among HLA class I loci and alleles (Table II⇑). The site α sequences match only one-half of the palindromic cAMP response element (51). However, the promoters of HLA-B7 (used here), HLA-B57 (used by Girdlestone), DRA, and the mouse class I gene H-2Kb, all contain an identical core site α sequence that binds ATF/CREB proteins (TGACGC) (27). Girdlestone et al. 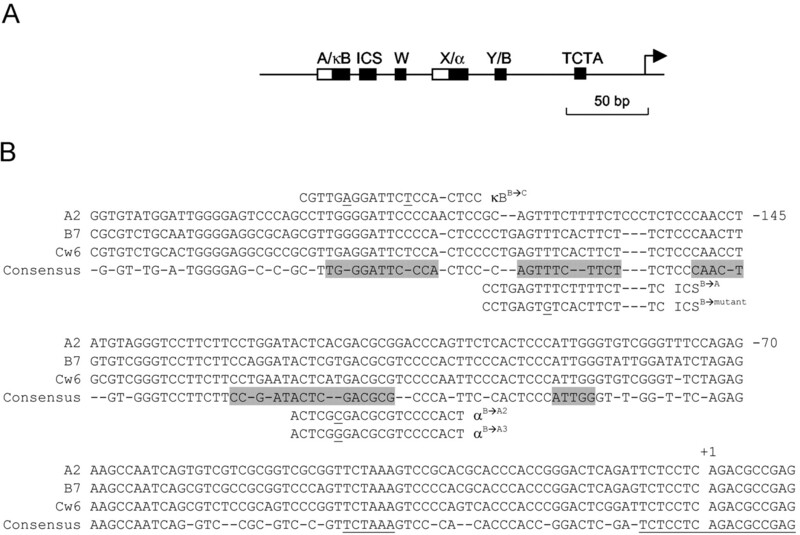 (38) showed that the site α from HLA-B57, but not HLA-A1, binds USF1 and CREB1. Gobin and colleagues (27) had previously reported that a CREB protein binds to site α of HLA-B7, but not HLA-A3. This group later demonstrated significant, albeit weak, ATF/CREB protein binding to the HLA-A2 site α (34). Site α of HLA-A1 contains a second variation in the USF site (Table II⇑B) that could account for its failure to bind USF1 and CREB. Despite the decreased affinities for individual binding proteins displayed by variant site α sequences in HLA-A2 and -A3, they mediated strong responses to cytokines and CIITA (Fig. 8⇑A and data not shown). The promoter activities correlate well with the gene transcript levels. One exception is the HLA-A2 promoter, which is constitutively weak and essentially unresponsive to IFNs in EC and HeLa cells, although IFNs induce significant HLA-A mRNA accumulation (compare Figs. 2⇑ and 5⇑). An IFN-γ-responsive element in the 3′ untranslated region of the HLA-A2 transcript may contribute to transcript accumulation (52). The element does not stabilize the mRNA, and the exact nature of its activity remains to be fully characterized. Griffioen et al. (53) identified transcription factor Yin Yang 1 binding to the 5′ untranslated regions of HLA-A1 and -A2 genes, but not HLA-B7 or -B27 genes, which they propose displaces a repressor. This untranslated region lies immediately 3′ of the cloned promoters used here and so does not contribute to their responses. HLA class I genes show constitutive and cytokine-induced expression patterns that are locus specific and cell type dependent. The molecular mechanisms underlying the differential responses, including transcription and mRNA processing, are beginning to be identified. For transcription, the effect of any single enhancer variant can be modulated by additional enhancers within the context of the entire gene. The ideal immune therapy would block dangerous responses while preserving or stimulating beneficial responses. Immune responses against pathogens, tumor Ags, and autoantigens are often dominated by single (immunodominant) peptides presented by specific MHC alleles. Therefore, decreasing the expression of individual MHC alleles or loci may specifically modulate immunity. The observation that HLA class I loci are under distinct constitutive and inducible regulation suggests that their expression could be manipulated independently. I thank Dr. Fengzhi Li for helpful suggestions on transfection, and Dr. Mark Collinge for the CIITA primers. ↵1 This work was supported by Grant R29AI35099 from the National Institute of Allergy and Infectious Disease, National Institutes of Health. ↵3 Abbreviations used in this paper: EC, endothelial cells; CBP, CREB-binding protein; CIITA, MHC class II trans-activator; cPCR, competitive PCR; hGH, human growth hormone; ICS, IFN consensus sequence; ISGF3, IFN-stimulated gene factor 3; USF1, upstream stimulatory factor-1; IRF, IFN regulatory factor; RFX, regulatory factor X.